Need a diagram, process chart, quick page-layout, website wireframe or graphic design? 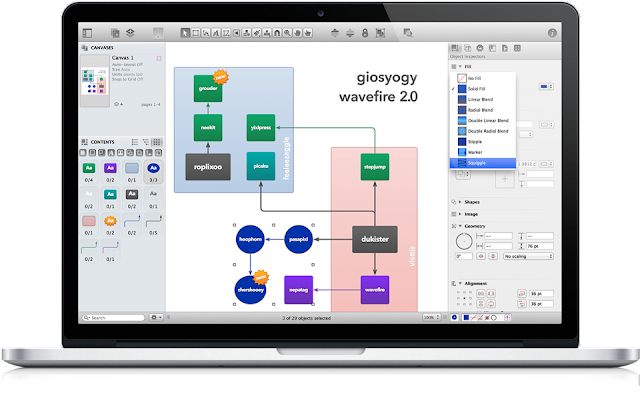 OmniGraffle can help you make eye-popping graphic documents quickly by keeping lines connected to shapes even when they're moved, providing powerful styling tools, and magically organizing diagrams with just one click. Whether you need a quick sketch or an epic technical figure, OmniGraffle keeps it gorgeously understandable. *OmniGraffle 6 offers a complete User Interface redesign from the ground up. *Application resources such as Templates and Stencils can now be fully managed from within the application. *Improved and powerful controls have been added to edit and mask placed images directly on the canvas. *New artistic Fill and Stroke styles have been added: Freehand, Stipple, and Marker. *Line Labels can now be set to follow the path of a curved line. *The color and position of manual Guides can now be set by hand, and can be dragged from one canvas to another. *Visio import/export: Open Microsoft Visio? documents (VSD or VDX) directly in OmniGraffle, as well as Visio stencils (VSS) and templates (VST). Export to Visio XML documents (VDX). *Shared layers: Easily update common elements that you'd like to display on multiple canvases. Layers can now be toggled between a normal and a Shared layer. *New controls specify which edge or center of an object is reflected in the Geometry Inspector. You can set the X and Y coordinates of a selected vertex point. *Shape combinations: Easily create new shapes using combinations of existing shapes (with support for union, intersection, and subtraction). Combined shapes can now be uncombined into their component shapes. *Resolution-independent Display Scale: When zoom is at 100%, match an Apple point, PostScript point, or screen pixel. *Photoshop export has returned, and supports the export of OmniGraffle layers to Photoshop layers. *Tables: Group shapes using tables, making it easy to add new rows or columns of your template shape.